The Academy makes available to its members and the public a rich and diverse library of newsletters, magazines, annual publications, and other documents that cover a broad range of public policy and professionalism issues. The Actuarial Standards Board's newsletter, with progress reports on the ASB's work developing and updating standards. Contingencies is the bimonthly magazine of the Academy that takes readers into the world of the actuary — insurance, casualty, health, pension, financial and risk management - through a wide array of feature stories, commentaries, interviews, how-to columns, and more. HealthCheck is the Academy’s monthly digital newsletter covering the actuarial perspective on health care reform implementation. The Life Perspectives is a quarterly newsletter designed to keep you up to date on activities of the Academy’s Life Practice Council. The Retirement Report is a quarterly newsletter that replaces two Academy publications—Retirement Account and Enrolled Actuaries Report—streamlining pension news into one easy-to-access source for enrolled actuaries and Academy members in the pension and retirement practice areas. This Week is the Academy’s end-of-week digital newsletter, compiling a week’s worth of news, updates, events, and media coverage in one convenient, easy-to-use publication. 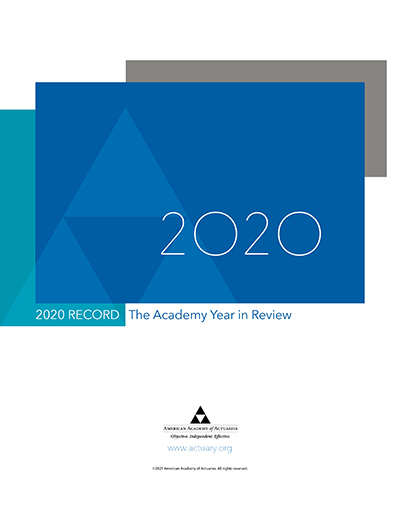 The Record is the Academy’s annual report to the membership and the public, recapping the work of Academy volunteers over the past year in serving the public and the profession. The North American Actuarial Council Annual Report compiles the cross-border work and collaboration of the nine actuarial organizations serving the United States, Canada, and Mexico. 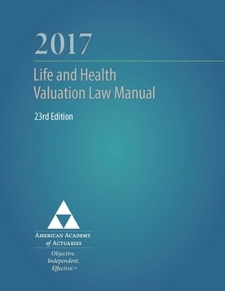 The Life and Health Valuation Law Manual, updated annually, is designed to help appointed actuaries comply with the requirements of the NAIC model Standard Valuation Law and the Model Actuarial Opinion and Memorandum Regulation. It outlines key valuation developments and state guidance, NAIC model laws and regulations that have an effect on reserve calculations, a discussion of generally distributed interpretations, and copies of the current actuarial guidelines from the NAIC Examiners Handbook. 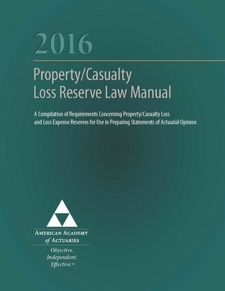 The P/C Loss Reserve Law Manual, updated annually, contains useful information to help appointed actuaries comply with the National Association of Insurance Commissioners (NAIC) Annual Statement requirements for a Statement of Actuarial Opinion (SAOs). It includes SAO requirements and state laws and regulations establishing those requirements; Annual Statement instructions for the SAOs for P/C, title loss, and loss expense reserves; and other pertinent Annual Statement instructions. Amicus curiae (friend of the court) briefs submitted by the Academy on litigation involving issues important to the actuarial profession. Brief for the National Federation of Independent Business, et al. v. Sebelius, Secretary of Health And Human Services, et al./State of Florida, et al. v. Department of Health And Human Services, et al. Brief for Municipal Employees Retirement System of Michigan v. Gabriel, Roeder, Smith and Co.
Brief for United Teacher Associates Insurance Co.v. MacKeen and Bailey Inc.
Brief for Shay et al. v. Howard et al. Brief for Shepley et al. v. New Coleman Holdings Inc. et al.